This market is spread over a large area. It closes by sunset so make sure you’ve got plenty of time and you have your comfy shoes are on. At Mapusa you’ll find antiques, textiles, traditional handicrafts, Goan pottery as well as spices, fruits, homemade pickles, sausages and so much more. This market attracts local vendors and traders from all over Goa where they come to haggle for clothes and everyday items. Not only will you find unique and well-priced souveneirs but you’ll also get to observe everyday life of locals. When planning your trip to Goa, be sure you’ve scheduled to be there on a Saturday night. The Night Bazaar at Arpora offers hard to find handicrafts that are slightly more expensive. However, Vendors offer great deals and a large variety of kiosks offering everything from spices to carpets, hammocks to clothing, textiles to accessories. This market attracts mostly foreigners looking to explore the heritage and culture of Goa. Held every Wednesday in the beach town of Anjuna in North Goa, this market is known as one of the liveliest in Goa. With its wide variety of products on offer, there is plenty of opportunity to practise your haggling and secure a bargain. This colourful market offers an abundance of local handicrafts, spices, clothes footewear, beach wear, artificial jewellery and accessories. Se Cathedral is one of the largest Churches in Asia and is dedicated to St. Catherine. The Cathedral took almost 80 years to build. 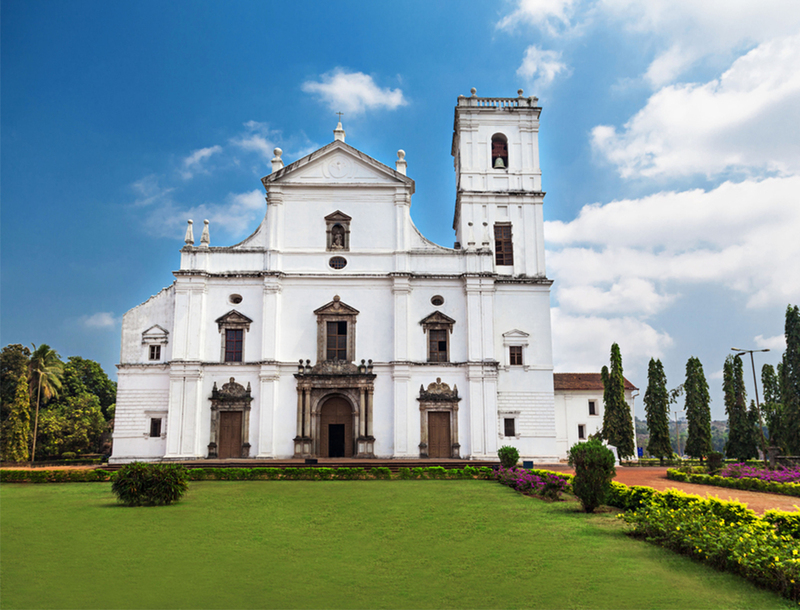 Legend has it that the Golden bell of this Cathedral could be heard all over Goa. When you visit the Cathedral, take a close look at the 14 alters inside. You will see each is more intricately carved than the next. This Basilica is significant to the Goans as it holds the mortal remains of one of the patron Saints of Goa – St. Francis Xavier. Francis Xavier died on board a ship and his body take to Malacca. It was later decided that he should be buried in Goa. On arrival of his body in Goa, more than 2 years afer his death, people noticed that Francis Xaviers body hadn’t decomposed. The Church deemed this to be a miracle and St. Francis Xaviers body is put on display to the public every 10 years (next being 2024). A silver casket designed in the 17th Century holds the remains of this Saint. Located in Goas Capital City, Panaji, this is one of the oldest Churches in Goa. The Church was originally built to welcome sailors home. It towers over the City with a statue of Mother Mary at the front casting a watchful eye over its inhabitants. This is one of the most beautifully preserved Churches and is used even today with devout Catholics stopping by to pray en route to work. Goa Carnival is one of the biggest annual festivals in Goa. Every February the festival celebrates the beginning of Lent. This four-day festival is a cultural extravaganza. See colourful floats, feasts, live music, dance, fire and acrobatic performances, sports competitions, fancy dress parades, and loads of other fun activities that showcases Goa, it’s culture and it’s traditions. This is India’s biggest Electronic Dance Music Festival attracting over 350,000 people and hundreds of artists every year. The festival is a 3 day dance party in the hills of Pune. You can expect spectacular performances by some of the greatest names in electric music including martin Garrix, Hardwell, David Guetta and Armin van Buuren. Vasco Saptah is an annual festival of seven-days in length; held in late July – August. It is held in the Vasco region of south Goa and reveres Lord Damodar, an avatar of Shiva. Shiva is believed to have saved Vasco from a severe epidemic in the late 19th century. Highlights of the festival include cultural and religious programmes, fairs and makeshift stalls selling everything from food and household items to clothes and accessories. Cavelossim Beach is known for its contrasting black rocks and white sand. It’s a peaceful beach that is perfect for relaxing, swimming or for taking a boat trip to see Dolphins or trying out a whole range of water activities. Known as one of Goas most beautiful beaches, a thick forest of coconut palms lines this idyllic spot. The semi-circled shaped beach boasts calm waters and white powdery sand. Its bamboo beach huts and picture-perfect setting has an unparalleled natural serenity. Arambol is hands down one of the best beaches in Goa. 16 km in length this unexplored beach is surrounded by cliffs on two sides and has a Fresh Water Lake nearby. This cove like beach is a traditional fisherman village with bohemian feel that attracts many international tourists and alternative travellers. Be sure to allow yourself enough time to take advantage of all that’s on offer. There are so many things to see and do… We think Goa is great and after making your way through the above, we’re confident you will too!